"I see the history of my country becoming ashes. It has no price. I'm devastated." 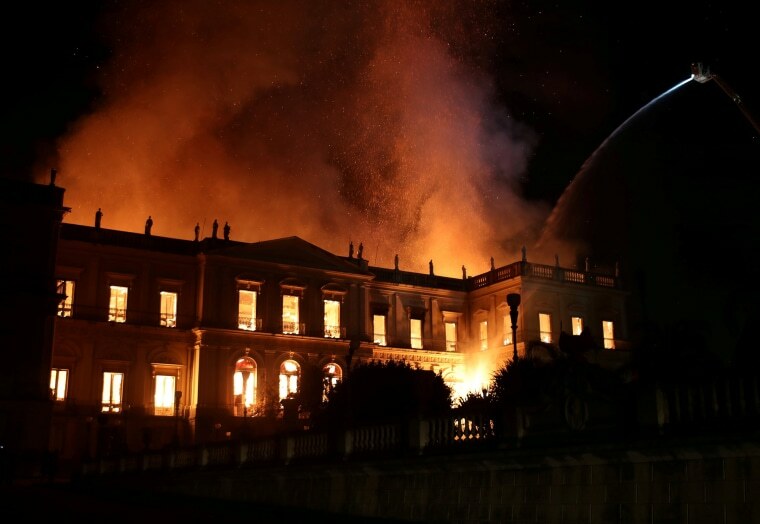 RIO DE JANEIRO — A massive fire that raced through Brazil's 200-year-old National Museum on Sunday is believed to have destroyed much of its collection of more than 20 million items, ranging from archaeological finds to historical memorabilia. The destruction of the building was an "incalculable loss for Brazil," President Michel Temer said in a statement. "Two hundred years of work, research and knowledge were lost." It wasn't immediately clear how the fire began. There were no reports of injuries, the museum said. Fire department spokesman Roberto Robadey said crews got off to a slow start fighting the blaze because the two fire hydrants closest to the museum were not functioning. Instead, trucks had to be sent to get water from a nearby lake. "It's a national obligation to reconstruct it from the ashes." "It is an enormous tragedy," museum director Alexander Kellner said in a statement posted on Facebook early Monday. He added that they haven't yet been able to measure the total damage to the collection. The museum, which is tied to the Rio de Janeiro federal university and the education ministry, was founded in 1818 and is proudly celebrating its bicentennial. It houses several landmark collections, including Egyptian artifacts and the oldest human fossil found in Brazil. "We never got anything from the federal government," said the official, Luiz Duarte. "We recently finalized an agreement with [state-run development bank] BNDES for a massive investment, so that we could finally restore the palace and, ironically, we had planned on a new fire prevention system." Rio residents watched the blaze in horror. "I see the history of my country becoming ashes. It has no price. I'm devastated," Rio resident Isabelle Ramalho told the Associated Press. In a statement posted on its website in June, BNDES agreed to financing of $5.35 million to "physically restore the historic building" and also to carry out work to "guarantee more security to its collections." Museums from around the world, including the Louvre in France and The British Library, tweeted condolences and messages of support to Brazil. Ross Cullen, Michele Neubert and Rachel Elbaum contributed.